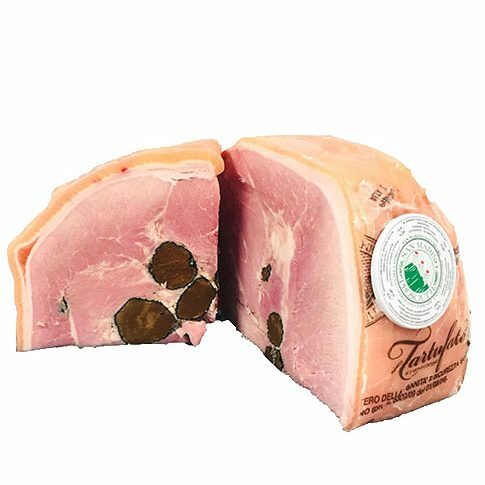 Prosciutto Cotto Tartufo - Zuercher & Co.
San Marino is a microstate in Italy, known as the ‘Most Serene Republic.’ As the oldest independent state in Europe, they take pride in their heritage and tradition. At San Marino Prosciutti, they only use Italian pigs, which live longer and are allowed to grow larger than other European pigs. They take time and care, with a production process of 31 days, rather than the 7 day industry standard. The deboning, brining, massaging, are all done by hand, and then left to rest for several days until it gets steam cooked (“cotto” means cooked in Italian). Whole black truffles are coursing through this ham; you get a bit of that luxurious flavor in each bite. The meat is steam cooked with the skin so that the ham retains its juiciness. The truffle doesn’t over power the richness of the meat, and the two complement each other wonderfully.